Most of the times it’s not necessary for the users to remember SMS KEYWORDS for any operator to seek information or HELP. For the interest of the users along with adding comfort, Operators should design their sms navigation system in such a way that whatever keyword user has sent they should be able to get suggestions for correct KEYWORDS or required help in the form of a return sms. This feature benefits both the users as well as the Operators as it’s not necessary to maintain or provide services on some particular KEYWORDS. We have checked this type of functionality on all of our AVOID Operators along with Aircel. 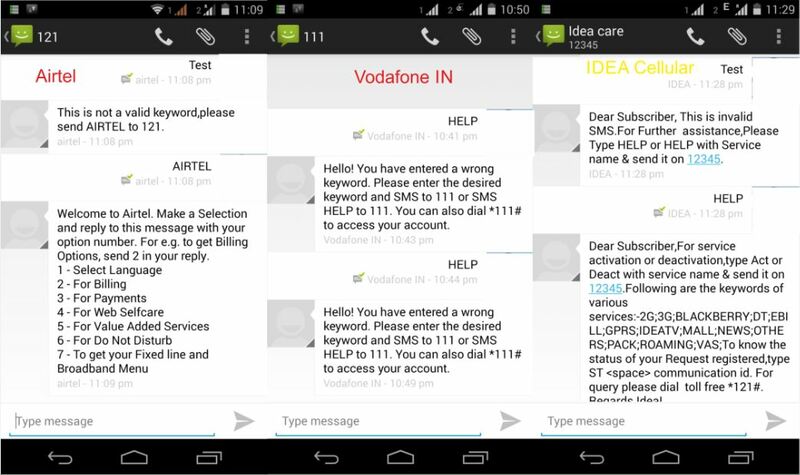 If we observe Airtel(AP Circle Number) has set it very clear and simple,what ever wrong keyword user sends the sms system asks to send ‘AIRTEL’ to 121 to get required suggestions and the same way with Idea cellular(AP Circle Number) to 1234 as seen from the image. 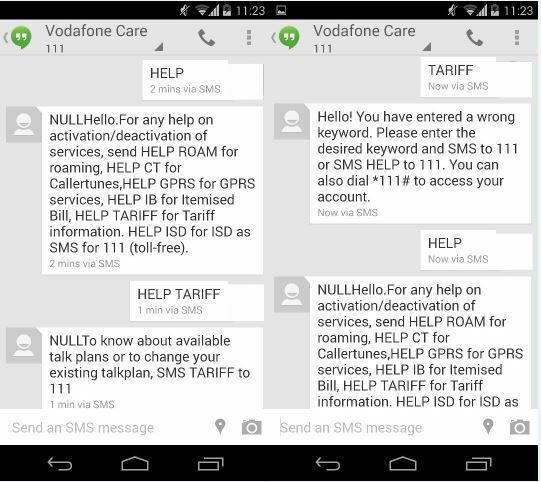 But I was surprised to see the response from 111 of Vodafone IN(AP Circle Number).You can clearly see from the message that the SMS system of Vodafone failed in this case. They tried to provide a similar kind of service but it was utter flop and no way useful for users. So,we decided to check if the fault exists in other circles as well. 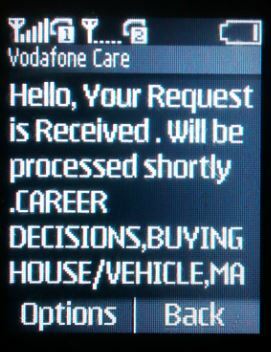 I have come across a special keyword – NULL in the beginning for every reply sms.For every try i failed to get any useful response from the sms system of Vodafone.Pity on them for such a poor SMS response system. Wow! That’s an amazing response this time. For our HELP message we received a response “Hello,Your Request is Received.Will be processed shortly”. I was wondering what is that the system will be processing shortly for my sms HELP request on my number 🙁 ? And oh that’s not the end of the message,even we have a VAS Promotional message included too 😉 Clever ah. Two blunders at a stretch and are the customers expected to tolerate such stuff ? Aircel: Initially I’m happy that Aircel too provided similar kind of Services. 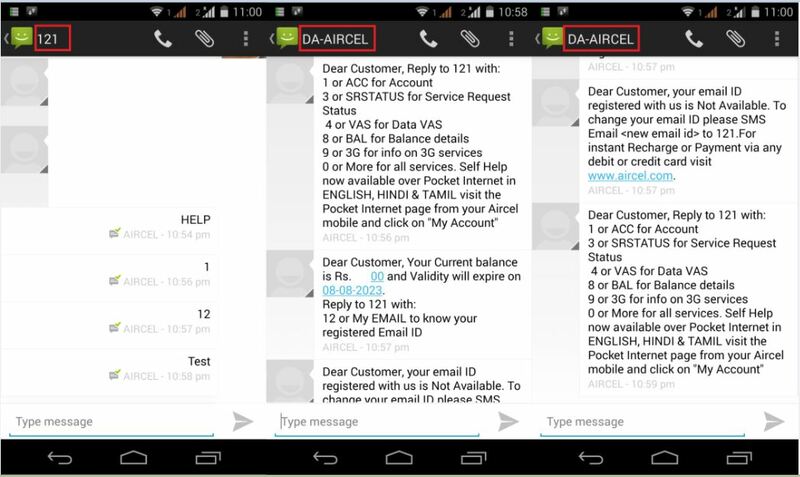 It can be clearly seen that User needs to reply to 121 but Aircel system responds from DA-Aircel which can’t be used to directly reply. So,every time we need to go out of Message thread and reply to 121 which is very troublesome and spoiled the entire user experience. Dear Aircel please improve user experience. 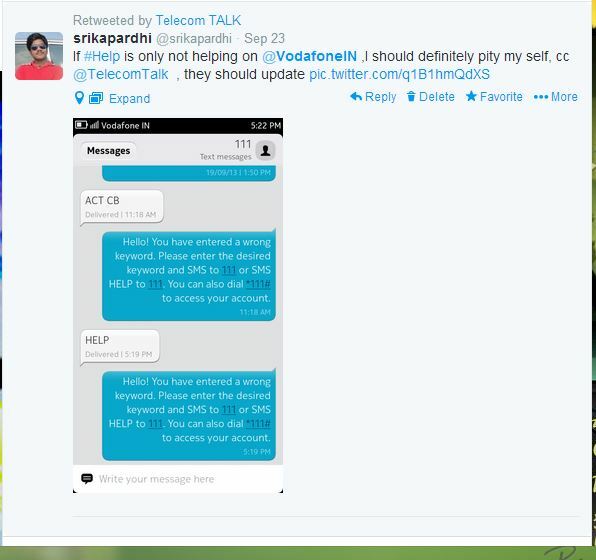 Regarding Vodafone, I have complained long back on twitter handle of @VodafoneIN to which they responded but never cared to rectify their defective system till date. Dear users, have you faced any such issues with your operator in your circle? Do you like to tolerate this kind of services from premium operators? Do let us know any of your such experiences via comments. Vodafone is going worst everyday….. I had activated 3G pack of 1gb n I was not getting 3g signal In manual search I was getting vodafone,idea,bsnl….i selected vodafone but it didnot register I then sms ACT 3G to 121 but after sending my phone got registered on 3g but in 2min my full 1gb + 35rs talktimr finished when.i called cc they said u havd.used u r full pack …..wtf……within 2min how an 1gb finish in 2min…..now giving my no for porting to idea/bsnl…..Vodafone f***k off!